Provides methods and properties for interacting with the progress indicator on the system tray on an application page. The ProgressIndicator type exposes the following members. ProgressIndicator Creates a new instance of the ProgressIndicator class. IsIndeterminate Gets or sets a value that indicates whether the progress indicator on the system tray on the current application page is determinate or indeterminate. IsVisible Gets or sets the visibility of the progress indicator on the system tray on the current application page. 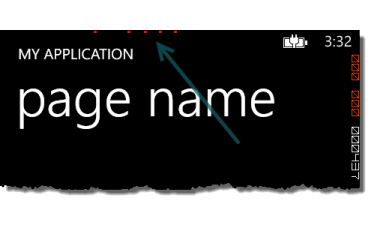 Text Gets or sets the text of the progress indicator on the system tray on the current application page. Value Gets or sets the value of the progress indicator on the system tray on the current application page. IsIndeterminateProperty The dependency property for IsIndeterminate. TextProperty The dependency property for Text. ValueProperty The dependency property for Value. To use the ProgressIndicator without affecting the layout of the page, set the value of the Opacity property of the SystemTray to 0 (zero). The following screenshot shows an indeterminate progress indicator scrolling across the top of the screen in the system tray. The following code example shows how to use the ProgressIndicator class. The following code example shows how to use the ProgressIndicator on the SystemTray from XAML. This code goes inside the PHONE:PHONEAPPLICATIONPAGE element. Note that the IsIndeterminate, IsVisible, Text, and Value attributes can all be data-bound.